John Jones may have been baptised as John the son of Thomas John and wife Hannah on November 23 1798 in Clydey (Clydau) Pembrokeshire. In the 1851 census John Jones (50) Head, Farm Labourer born	Pen...(? ), Carmarthenshire was in Trallwn, Llanelli, Carmarthenshire with Mary (56) Wife. In the 1861 census John Jones was described as a thatcher aged 62, born Clyde, Pembrokeshire with wife Mary (64) born Kilrhedin, Carmarthenshire. The baptisms of a number of children of John Jones and Mary James of Clydey are recorded in the register of Rock Dissenting Congregational Chapel, Trelech a'r Bettws, Carmarthenshire. Their birthdays are shown. Born Clydey 15 May 1821. Not with parents in Llanelli in the 1841 census. Possibly remained in the Trelech a'r Betws area as a farmer with a wife Margaret some 15 years older than him. This couple did not appear to have had any children. Born Clydey c. 1822 - on census not baptism. Not with parents in Llanelli in the 1841 census. In 1851 she is with her parents as Rachel (28) Daughter At Home. Born Clydey 9 September 1823. Not with parents in Llanelli in the 1841 census. Born Clydey 13 March 1826. Not with parents in Llanelli in the 1841 census. Born Clydey 15 October 1828. With parents in Llanelli in the 1841 census. He is in the 1851 census with his parents as Michael (23) Son Coal Miner. John Richard Jones engine driver born Victoria, Ebbw Vale c.1861. In 1891 John R. Jones (29) stationary engine driver living next door to his mother with wife Edith (28) (probably Edith Evans) born London (in the 1901 and 1911 censuses given as Shepherdess Walk, Shoreditch likely to Thomas Evans, a Tinman, and wife Rebecca) and two children Thomas Richard Jones (c.1885- ) and Evan Rees Jones (c.1888- ) born Victoria and Waunlwyd, Ebbw Vale. Edith was the only non-Welsh speaker, virtually all the others being bilingual apart from Welsh-only Mary. By 1901 they were in Six Bells, Abertillery when John R was a colliery mechanical engineer and in Pwll, Llanelli Carmarthenshire in the 1911 census when the two sons had ceased to speak Welsh. (Note Edith Evans is found in the 1871 census living with her father's sister Sarah Ann North and husband Silas North in Dawley, Shropshire. The North family were in Augusta Street, Bedwellty in 1881 where Silas was a baker and confectioner). David John Cheedy (July 19 1891-1970) married Edith Jane Reed (1891-1960) in 1912. They had Gwyn R Cheedy (1913-1922), Frederick John Cheedy (1916-1976, died Cwmbran) who married Letitia Woosnam (12 April 1929- 9 April 1997) in 1949 and Colin Cheedy (1924-1931, died Blaina). Ceinwen Cheedy (May 2 1894- August 26 1972). Ceinwen was at 10 Windsor Road, Six Bells, Abertillery (Pontypool District) in 1939 and 1972. Winifred Cheedy (Sep 14 1897-1965) married Aneurin Clarence Spencer (Nov 25 1893- Jan 11 1965, died at 7 Tircoed Road, Glanaman, Carmarthenshire) in 1919. They were at 28 Coronation Street, Nantyglo in the 1939 Register when Aneurin was a road sweeper and 41 Bourneville Road, Blaina, Monmouthshire prior to Aneurin's death. They had Marie Spencer (July 29 1920-1997), a shop assistant in 1939, who married third-cousin James Thomas (1920- ) from Glanaman, Carmarthenshire and had Meryl S Thomas (1944-2011). Doris Cheedy (August 31 1901-1973) married Walter Poskitt (March 11 1901-1973) in 1930. 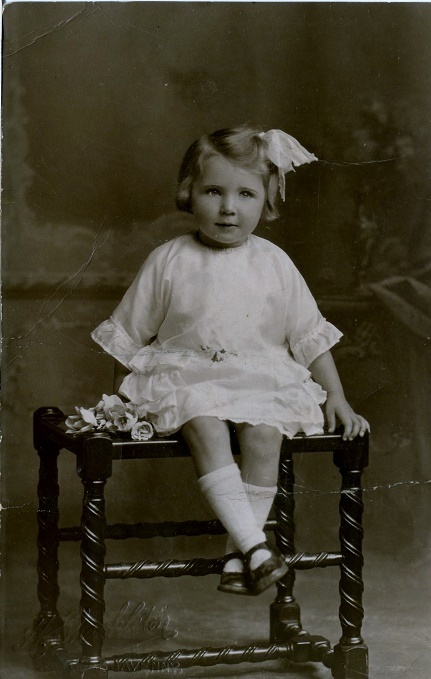 Doris Poskitt of 10 Windsor Road, Six Bells, Abertillery, Mon died 10 December 1973. William Thomas Cheedy (1905-1905). Note that the 1911 census names him but also states that one child had died. Marion Evans (25 Sep 1898-1971). She married Thomas Morgan in 1932 and was living at Llwyncelyn, Glanaman, Carmarthenshire in 1939. Thomas Herber Evans (Feb 8 1902- Feb 4 1978). 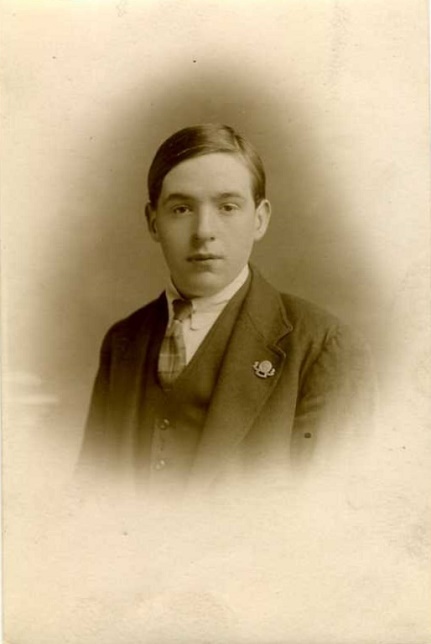 Thomas H Evans, Colliery Labourer, was still at 11 Chapel Road in 1939 with Gladys Evans (14 April 1889- ) - John Evans' daughter from his first marriage. David Rees Jones (1869-), born Victoria, Ebbw Vale. Thomas William Jones (c.1872), born Victoria, Ebbw Vale. A boiler maker in Queen Street in 1891 and a colliery fitter with brother John R. in Abertillery in 1901. In 1911 he was a colliery engine fitter in Abertillery with wife Edith Emily Thomas (1874- , born Briton Ferry) and musician nephew Frederick Dalrymple (1889-1963, subsequently organist at Canton Parish Church). Thomas and Edith had married on March 9 1905 at the parish church in Llanhilleth, witnessed by J R Jones and Florence Mary Trotman. 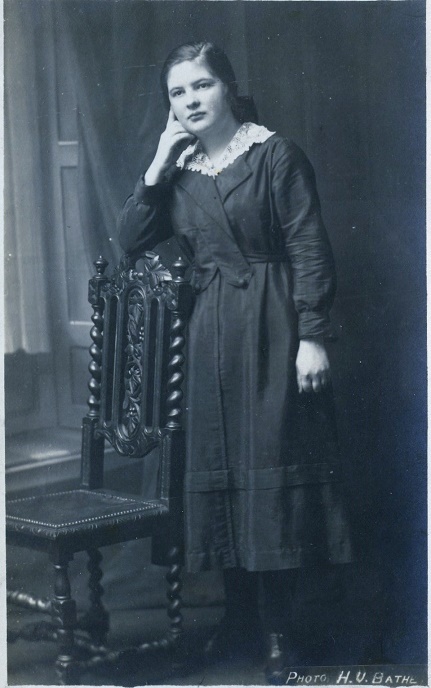 Margaret Jones (c.1876), born Victoria, Ebbw Vale. Hannah Jones born Clydey 22 June 1833. With parents in Llanelli in the 1841 census. Hannah (18) is in the 1851 census as Daughter Tin Worker and (25) in the 1861 census. John Jones' grandson Evan (4) born in Llanelli appears in the 1861 census. In the 1871 census Evan John (1856-1931) is shown as Hannah's son. 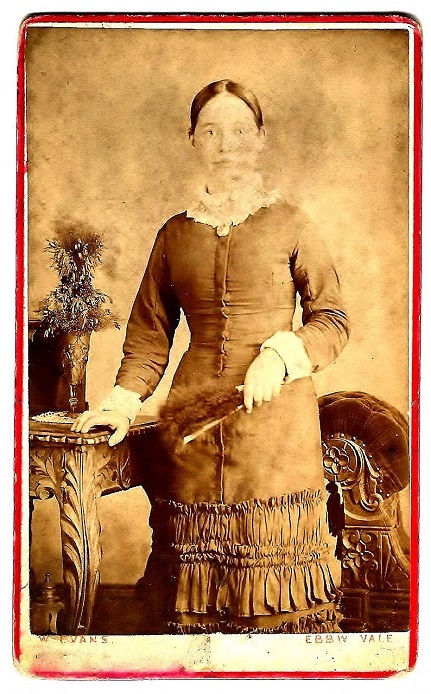 Hannah married William D. John (1841-1915) in 1865 and had Mary Jane John (c.1866- ), David E. John (1872- ) and Rees John (1875-1919) in Maesteg, Glamorgan. They emigrated to the USA in 1882 (see Hannah Jones and William D John of South Wales and Scranton, Pennsylvania). Hannah's son Evan remained in Maesteg (see above link for more). With parents in Llanelli in the 1841 census. David (15) is in the 1851 census as Son Tin Worker. David Jones, an engine tender, was a lodger with Thomas Jones in Victoria, Ebbw Vale in 1861. With parents in Llanelli in the 1841 census. Margaret Jones is in the 1851 census as (10) Daughter. Evan John Robinson (1905 - 20 Dec 1950) who died in Vancouver BC. Evan John married Julie Bullich (born Ladysmith, BC on 1 June 1910, died in Victoria BC 7 March 1979). Evan's death certificate shows him to have been in the province for 39 years and that he had been a truck driver, although he apparently had not worked for the last 7 years of his life. Gladys Georgina Robinson (1914-1988) who married Hervey Milton Neff (1912-1968). Hervey was a pipelayer in Yarrows Yard and died suddenly at work. All (except Julie Bullich) are buried in Colwood Pioneer Cemetery near Victoria, BC. Rachel Ann Jones (1876- ) married tinworker Thomas Jones (1877- ) and had Elizabeth Ann Jones (1897- ) born Llanelli, Beatrice Jones (1900 - ) born Aberdare, Ethel May Jones (1903- ) born Llanelli. They lived at 8 Brynmor Road, Llanelli in 1911, having been married for 14 years and lost one child (Beatrice). Evan John Jones (9 February 1880-1972) married Edith Marian Griffiths (1883-1909) in 1906. They had Cicely or Cissily Maud Jones (1908-1920, baptised March 28 1909 at St Peter's Llanelli) and was a widower in the 1911 census. They lived at 8 Brynmor Road, Llanelli in 1911. In 1939 he was a widower, Builders' Foreman, at 44 Lakefield Road, Llanelli with a housekeeper, Edith Bevan (b.1890). An Evan John Jones of 5a Elgin Road, Pwll, Llanelli died 1 February 1972. Samuel Thomas Jones (Dec 25 1887-?1957), a tinplate worker living with his parents in 1911. The Cambrian Daily Leader 14 September 1917 records that '...Pte. Sammy Jones son of the late Mr. Evan Jones, St David-street) ... wounded in France.' The Army Casualty List, 21 September 1917 shows S T Jones, Wounded, Service Number 41134, South Wales Borderers, Hometown Llanelly. His medal card indicates also that he was in the Royal Welsh Fusiliers, Service Number 61423. In the 1939 Register he is described as single and a 'War Pensioner, Labourer prior to 1914', living at 69 Station Road, Llanelly MB.